New Year is coming. You’d probably want to redecorate your walls for the new year. Now is the chance to enter giveaway below and win removable vinyl wall decals. Once December is over, life slows down a little. It’s a great time to work on a project that has been on hold for a while. Maybe you want to redecorate a room, or you are expecting a baby, and it’s time to decorate a nursery. Anytime you need to decorate a room – it can be a lot of work – but not when you use wall decals from EvgieNev. 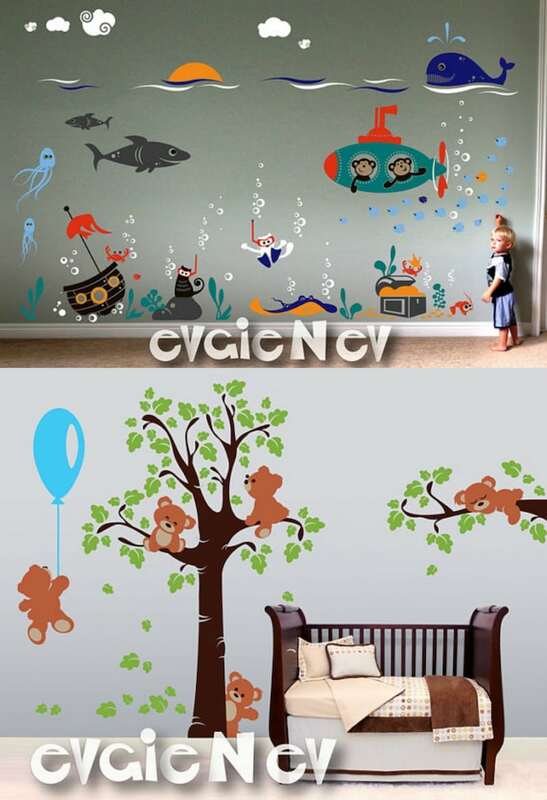 Wall Decals from EvgieNev are easy to apply, and in just a few hours you have a fresh new room! EvgieNev Wall Decals are customize-able: you can changes the size, colors, and even add or remove elements to facilitate any ideas and styles. Here are a few wall decals to help you to be inspired! This set includes Penguin, Bear Cubs, Orca Whale, and Narwhal. It illustrates Penguins having fun and Polar Mama Bear with Cub and two famous Whales, on the background of the ocean with icebergs and mountains. 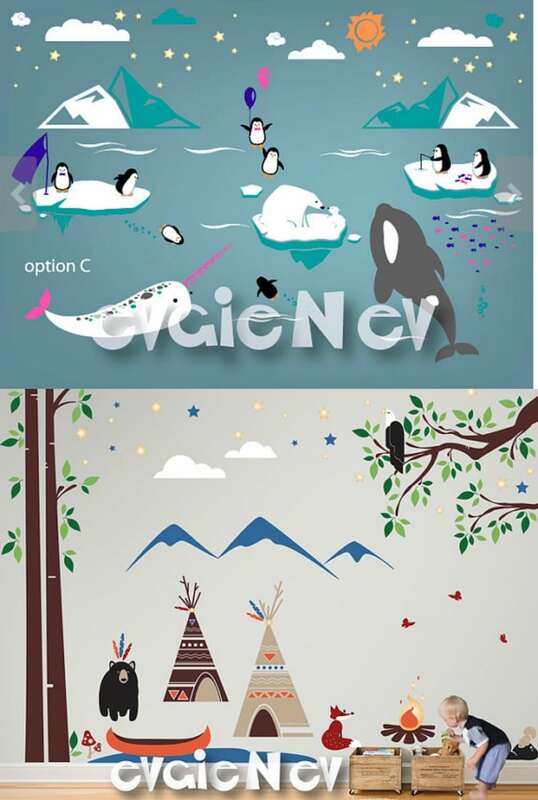 Stunning Pioneer Time wall decals theme is featuring First Nation playing camp with TeePee, Canoe, friendly Black Bear, Campfire and Eagle, set on the natural landscape and surrounded by clouds, mountains, and stars. This is a very warm illustrative setup promoting empathy and imagination of play time while highlighting Indigenous People history and spirit! The Panda is the cutest bear in the world. It is native to south-central China. 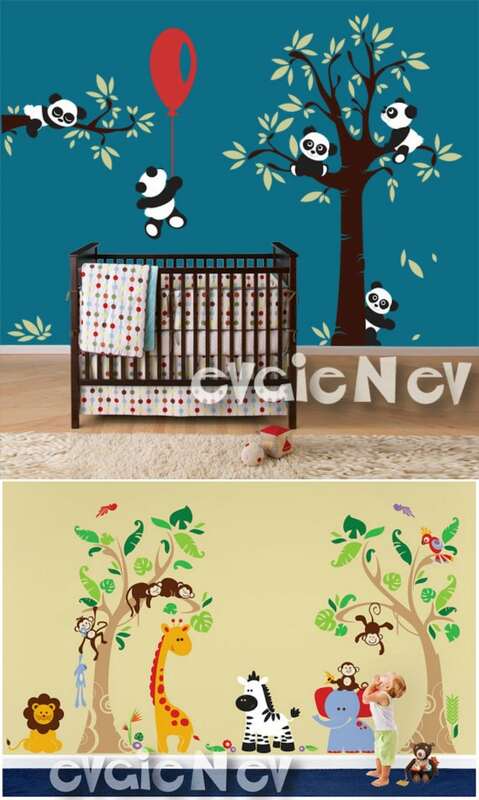 Spruce up your nursery room up with flavor of China theme and charming little bears tricking around. We love the decals. I changed the colors to suit our nursery and the customer service I received was wonderful. I requested color samples to help make my decision. My overall experience was awesome. Again, we love the cute panda decals! This set includes Monkeys, Giraffe, Parrot, Zebra, and Elephant. 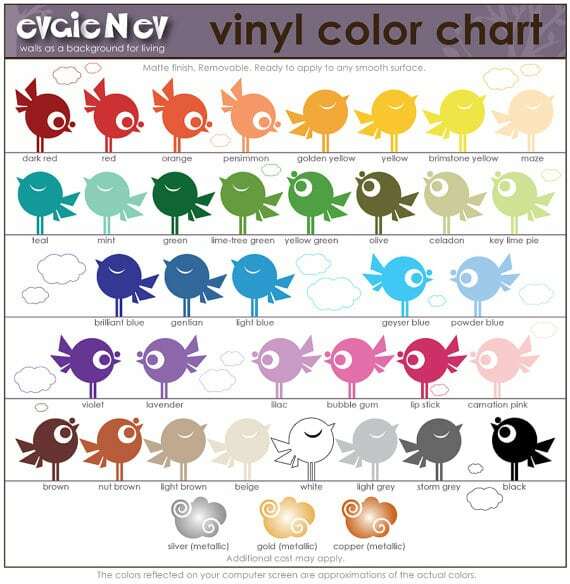 It is handmade using top-quality matte vinyl and is perfect to decorate and add your personal touches to any space. This fun decal with sea creatures and submarine monkeys, cats, scuba divers and sunken pirate ship! These are the cutest Teddies in the World. They are not just plush toys sitting quietly around; they are trendy and curious animals doing all kinds of tricks enlightening your nursery room: climbing a tree, flying on a balloon, resting up high on a branch, playing hide and seek. Most of the wall decals are customizable. There are so many colors to pick from. Some sets come with freebies! Now for the giveaway! 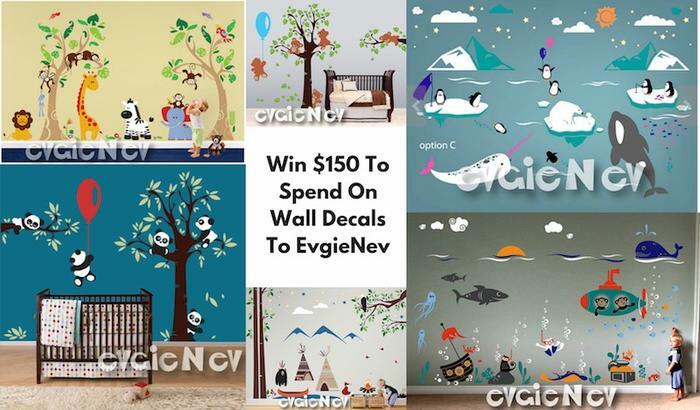 Enter to win a $150 credit to EvgieNev Wall Decals. It is open Worldwide (but if you live outside of the US or Canada you will pay the difference in shipping). 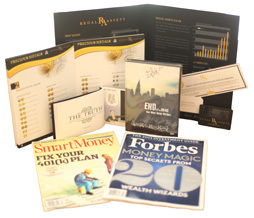 This giveaway ends on December 22 at 1159pm EST. Disclaimer: This information is brought to you by Evgie Wall Decals. All opinions are my own. Work Money Fun is not responsible for prize fulfillment. Sponsor is responsible for awarding prizes to winner of removable vinyl wall decals giveaway. I really love the alice in wonderland wall decals.